While paper cutting art is most often associated with Chinese and Japanese crafts, paper cutting actually crosses cultural boundaries. The German art of Scherenschnitte, which is less well-known than the Chinese and Asian forms of paper cutting, is just as intricate and features western themes and motifs. Chinese paper cutting art began in the 6th century when women began cutting gold and silver foil designs to wear in their hair and men used cut paper designs in temple rituals. Chinese craftspeople adopted paper cutting art as a form of decoration for gates and windows. To this day, paper cutting is a popular folk art form, especially among rural women. 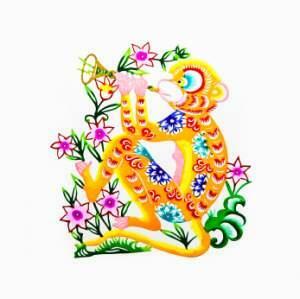 Using only scissors and a craft knife, Chinese designs are intricate and include traditional motifs, such as signs of the Chinese zodiac, chrysanthemums, lotus, and other flowers, and scenes from daily life. Paper cuttings often make up part of Chinese New Year decorations. The Japanese art of paper cutting, kirigami, is related to origami, Japanese paper folding. Most kirigami items are usually folded in some way before they are cut to make clever figures. One of the more intriguing but simple figures that can be made by both folding and cutting is a kirigami Christmas tree. Like origami, kirigami figures include animals and birds, flowers, stars and snowflakes, and other natural items, as well as representations of common household items. Pop-up cards, architectural forms, and other elaborate and decorative cut-outs are included in the art of kirigami. The tradition of paper cutting traveled from its origins in China to Europe, where it was adopted as a decorative folk art. Germans who settled in Pennsylvania brought with them a notable form of the art, known as "Scherenschnitte." Intricate paper cutting was used to decorate birth certificates and wedding certificates and to make Christmas ornaments and wall decorations. Silhouettes of human figures are also popular subjects for Scherenschnitte. Paper cutting art requires only the simplest tools; however, a pair very sharp scissors with a good point are almost essential. A craft knife, such as an Xacto knife, is very helpful for tiny cut-out areas, especially when the paper is cut without folding. Cuticle or nail scissors work well for tiny curved areas, but they should be retired as manicure implements once they have been used for paper. Choice of paper is almost limitless. You can use everything from scrap paper through fine parchment and vellum for paper cutting art; however, the more serious your skills and your projects, the more you will want to invest in the paper. If you are paper cutting with children, be aware that magazine covers and pages and used wrapping or computer paper are likely to give better results than newsprint or construction paper, which is soft and subject to tearing. Paper cutting projects can range from very simple to complex. You may already know something about some of these simple projects suitable for children and beginners, but it's always fun to refine your technique. Fold a square piece of paper in half. You can use computer paper trimmed to a square or square origami paper for this purpose. Then, fold the paper into the thirds, holding the paper by the point of the triangles formed. Fold the resulting piece in half. Holding the point of the triangle in one hand, cut one side of the snowflake point, which will be repeated twelve times to form a six-sided snowflake. Unfold the paper to reveal the snowflake design. If you are a beginner, you may want to create your first snowflake patterns online, using Make-A-Flake. This online tool also demonstrates the folding and cutting steps required to cut a snowflake. Paper dolls are fun to cut and are not limited to human figures. You can cut strings of animals, trees, plants, flowers, and other objects, as well as people. The trick is to make sure that the individual figures remain connected. To cut a string of human figures, use a long strip of paper. Fold the paper in half. Fold it in half again twice. This will give you four finished figures. Remember you are going to cut only one side of the figure along the outside on the open edge of the final fold. Make sure that you leave the figures' hands connected on that open edge. For more detailed instructions with an illustration, see How to Cut a String of Paper Dolls by Jen Gagne. Paper cutting art is a craft accessible to anyone, including children, who has a sharp pair of scissors, some paper, and imagination. Even magazines, newspaper, used wrapping paper, old file folders, and flyers, as well as inexpensive printer paper, can be used for paper cutting projects. It's nice, of course, if you can afford finer papers for your projects, but it certainly is not necessary.